While I was out walking around Lake Chabot today, two grainy photos were texted to me. 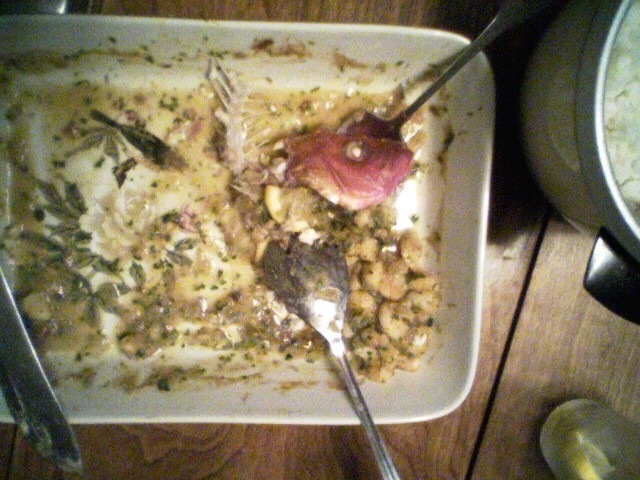 The first was of a fish in a baking dish and the second was of a dish with nothing but a fish head and a couple of shrimp in it. The pictures were not wholly unexpected as I had spent the last couple of days on the phone or writing detailed emailed instructions for my sister in Georgia preparing for this proud moment. I’ve been doing these bi-coastal (and one intercontinental/hemisphere) cooking lessons with my sisters in Georgia and a friend in North Carolina. Grace and I made fried rice via Skype instant message from Hong Kong and Elisa made broccoli cheddar soup (basic skill: the roux) via Skype video. There was a lot of “hold the computer up to the pot so I can see how thick it is, and hmm, maybe you should put a little more cheese in it and don’t be shy with the salt.” Joy made the soup too by reading the instructions I had written Elisa. I got a text photo of the soup too. 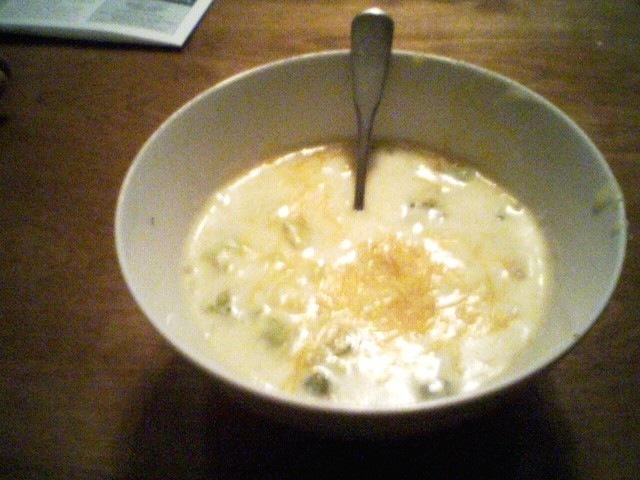 Broccoli cheddar soup doesn’t photograph as prettily as one might wish, but there were apparently no leftovers in either case. Joy and Elisa went a little more “advanced” and made oven tandoori chicken (basic skill: roasting) with a lentil curry and some coconut rice. I wrote instructions for all the tools, ingredients, and prep schedule. I wrote timelines to help them get everything done at the same. It was gratifying to see them feel confident enough to try for bigger challenges. Elisa emailed this week that she had been busy moving, but had “winged” a stir-fry that she thought would make me proud. Then Joy called because her boyfriend was in town and she was hoping that they could make some seafood. Cooking fish, nay, buying fish is intimidating to the neophyte cook, so I was excited to get them going. They called me from a fish market on Buford Highway in Atlanta and I asked them what they were thinking about and what they saw. They said “tilapia, catfish, Dungeness crabs” so I asked what the prices were and that tilapia made good fish tacos, and then if they saw any shrimp and whole fish. We talked about how much crab per person, or whole fish with a sauce and settled on a whole snapper (“they should be smooth and colorful- if they look faded and the scales look rough, it’s not fresh”) I had them ask the fishmongers questions, sniff things, look at the eyeballs. I hoped they were having as much fun as I was because there is not a fish market or farmers market or ethnic market that I won’t wander into. I once ordered chicken feet through the medium of improvised sign language due to a spoken language barrier in a Mexican grocery, and located Szechuan peppercorns in Hong Kong by enthusiastically demonstrating their potential effect on my tongue. I’m not easily daunted. I sent them an email with cooking instructions, drawing from the skills practiced previously ( roux, roasting) and told them how to make shrimp stock for their sauce. 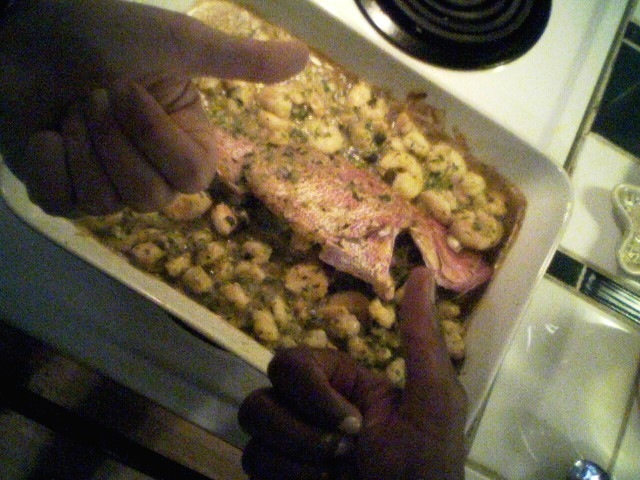 They made a whole roasted red snapper with an etouffe-like shrimp sauce stuffed inside and poured over before serving it. They made rice to soak it all up. We did one quick call to clarify the instructions and that was it. I love food. I love learning about it, cooking it, eating it. I love the insight I get into other cultures through food. I love sharing a meal with beloved company, feeding people I love with the good work of my hands. And I love bringing out that enthusiasm in other people. This teaching thing is a lot of fun. I MADE THE BLOG!!! : ) I feel so proud. Christine, you give great guidance and you’re enthusiasm is contagious.